"Why is there only one Trans-Canada route?" An Epic Failure Cut Canada in half? Too Easy! Unbelievable! No, this is not fiction. An epic failure cut Canada in half. For a short time, the failure of the brand new, Nipigon River Bridge cut Canada in half. Unbelievably, this bridge is the ONLY link between eastern and western Canada. The bridge transfers $100M in goods across the Nipigon River every day of the year, hauled by thousands of transport trucks and other vehicles in both directions. In addition, Canadians cross this bridge daily, emergency vehicles, tourists, every bit of traffic across Canada MUST use this bridge, so how could a project, critical infrastructure, so incredibly important to a nation —be allowed to fail? Do politicians recognize how vulnerable this leaves Canada and Canadians? Does the increasingly-demonstrated-incompetent Wynne government even realize the implications of what has occurred? Why is there only one Trans-Canada route? Let us ask that question again! Why is there only one Trans-Canada route? Bridge Design by Ego instead of Logic? The EPIC failure of the new, ego-generated, 'state of the art' cable stay (suspension-type) bridge on the TransCanada Highway (Highway 17) just east of Nipigon, Ontario, cut Canada in half instantly on January 10th, 2016 without any prior notice. Get that? People were stranded on both sides in sub-zero winter conditions. Emergencies were declared. Local c0mmunities responded by taking in travelers. Worth repeating, Highway 17, the TransCanada highway, is the ONLY highway link between east and west. It must be asked again, and again, if necessary, "Why is there only one Trans-Canada route?" Was this bridge considered suitable for Canada's extreme climate? Wind? Was the bridge designed by ego and hot air instead of logic? The Nipigon suspension bridge is the only one of its design in Ontario. "It will be a major tourist attraction, blah, blah, blah, " is heard from politicians constantly. The Epic Failure: by bad design and Inept Engineering, or Failed, CHEAP IMPORTED materials? The first half (with only two of the planned three pylons and one deck, presently consisting of two lanes, the future westbound lanes) of the bridge was in use. The bridge had only been opened to traffic (used temporarily for both directions) in November, 2015. The disastrous, epic failure resulted in one end of the bridge being heaved up about 2 feet (60cm) unevenly above the roadway, leaving the bridge inaccessible and temporarily unstable. Huge structural bolts snapped. The bridge deck reportedly raised about a half meter and settled back down, —but not back into place, leaving the bridge deck about 2' above the abutment ends and the highway grade. were improperly-tested, cheap imported materials from China used? Did the steel cables shorten in the extreme cold unevenly, putting undue pressure on the abutments, creating an upward slingshot effect when the bolts snapped? Were the cable webs tensioned improperly or unevenly? Is the design unbalanced? Was it an on-site construction or engineering error? Even if the bridge is repaired, will the same thing occur with the substantially colder and more severe winter conditions of Northwestern Ontario? Why was the bridge designed with three pylons—to ultimately carry traffic both eastbound and westbound on the same vulnerable structure, —at the same vulnerable location —when completed? To save cost? Is the bridge even safe to use? Is public safety now to be a major, long-term issue with this construction at this essential river-crossing? Who will be held responsible for this epic failure? The Wynne government, which approved this project? Why is a complete twinning of the Trans-Canada highway NOT a major infrastructure project of the Federal government? The severing of the Trans-Canada highway, the ONLY link across Canada is unacceptable by any stretch of the imagination. Action is required. Here at IncomingBytes we suggest that the FEDERAL government must, of necessity, become involved in the construction of an all-weather, fully-accessible alternative bridge link across this POTENTIALLY-DISASTROUS choke point in Canada —and investigate the handling of the whole project. *update: Single-lane traffic is now crossing the bridge slowly, alternating directions in turn, being led by a "pilot vehicle". Perfect. Traffic is delayed BOTH ways for an undetermined period of time while engineers and politicians alike scratch their heads to determine 'what went wrong' with this fancy piece of under-engineered ego...... and how to REPAIR the famous, failed bridge which cut Canada in half, —at a cost of $106 million dollars. Yes, $106M of taxpayer loot. Your loot. "In overview, SoWrite is almost a lifestyle"
What's a 'SoWrite' ? Perhaps the best definition is now "a successful website, no less than awesome". Certainly more than the average website, SoWrite.us.com, if such a concept is even possible online, the weary writer's sanctuary. A site which offers writers comfort and somehow, inexplicably, the 'feel' of a writer's sanctuary. Doesn't that sound a bit like a writing-escapist's-destiny? Just a bit? It is. This amazing writing website was built from scratch with nothing less than absolute smarts and dedication of the man behind the screen— a knowledgeable editor, publisher, author, creator and brilliant writer, family man, a skilled, meticulous designer and tradesman, a trusted business owner—you get the idea, an all-around awesome dude. For R& R with his family and better half out in the great outdoors, he heads down the road dragging a camping trailer equipped with firewood, cave-man fire tools, coffee pot, grub, the laptop, a great pup named Layla, —and plenty of books to read. Seen him? Yep...that's the guy. He's probably helped you at one time or the other, too. That's my friend Jim —Jim Bessey. Jim Bessey and I plugged away together in a number of interesting forays. Meeting first as writers in 2007 at Helium, as many writers did, we naively generated articles for that once-popular content mill, —which subsequently failed miserably and disappeared, taking into the great unknown a lot of unpaid, copyrighted content, the work of many writers. For optimists and real writers, that disappointment and failure simply gave us more reason to persist, to grow, migrate, try blogging, and explore new prospects having genuine potential. One door closes, another opens, write on, Shakespeare —you know the routine. Turning to blogging and other writing projects, we, in search of productive new ventures, got very busy. I started blogging on Incoming Bytes (Is that Incoming I hear?) 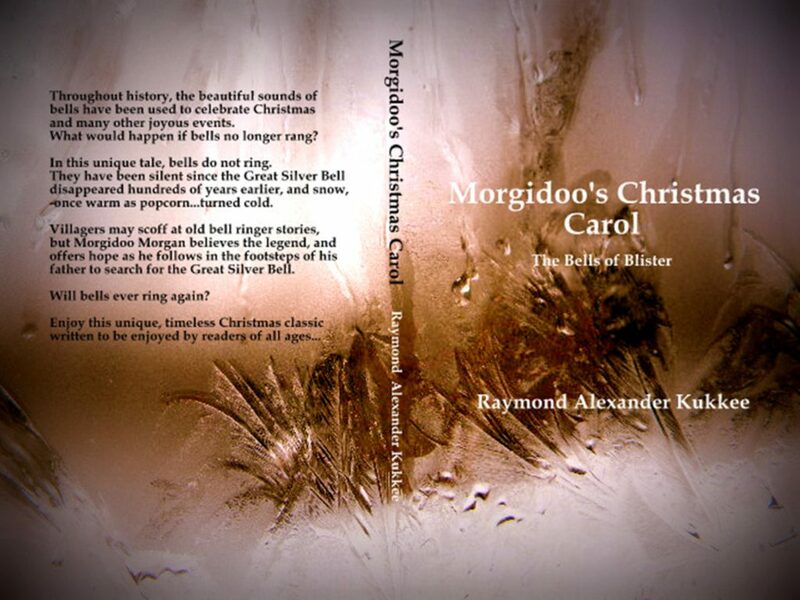 and concentrated on literary fiction, getting my novels The Fires of Waterland and Morgidoo's Christmas Carol, a Christmas classic for all ages, completed. And eventually published. With Jim's encouragement to persist. What else? It certainly wasn't long before Jim found new and greater challenges. He was already far ahead on the blogging curve, scribbling another website Just Camping Out. At his invitation, we became involved in writing, planning and management of niche custom freelancing content for another client. The paying kind. Wow. IN the writing life, it's not what you know, but who—the contacts you have. We were soon exercising creative limits, hard at work making significant decisions on content for a specialized website. We became organized, creating lists of potential titles, taking original photographs for illustrations, writing and posting original articles, furiously trading edits —then after a few months, abruptly wondered what happened when the principal website owner stopped communicating, *disappearing* into the sunset. The project(s) stopped dead in their tracks. ( *Oops--one of the unknown perils of the writing life. Jim didn't blink. He boldly constructed his new website SoWrite.Us.com. As if that challenge was not enough, he also accomplished some serious writing, co-authoring, editing and producing a novel, Beyond The Blue and the Gray by Tony Verna and Jim Bessey— including the detailed and intricate process of recording an audio version. Back in the ordinary world, a spec post of mine inevitably and proudly ended up on SoWrite. I am delighted to say Freelancing Pitfalls: *The Perils of Writing for Niche Sites, inspired by the Helium disaster and other events, coexists today with amazing, professional, insightful pieces written by Jim and others; thoughtful stuff which helps all writers turn the grit of the writing life into the real deal. There 'ya go. 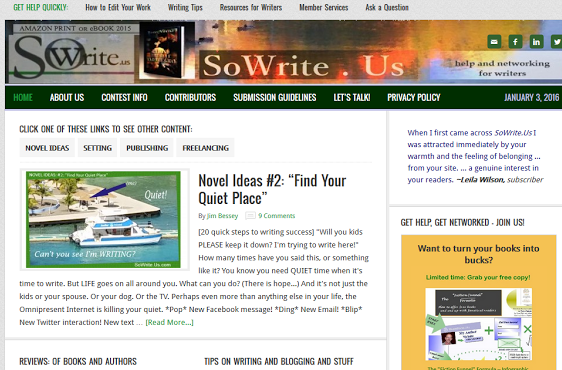 SoWrite is an attractive, friendly, well-designed, highly informative resource go-to reference for writing folk of all descriptions, ink-stained scribblers, editors, idealistic newbie dreamers, hard-bitten forgers of fiction, cautious experimenters needing mentoring, literary poetic-persons, and Jack and Jill freelancers, sharing skills and secrets with their colleagues. Independently-judged contests, new ideas, commentary, reviews, issues, advice. It's all there. In overview, SoWrite is almost a lifestyle—a polished comfortable website which most admirably, welcomes everyone. Jim fields, addresses, acknowledges, and includes discussions on books, articles, challenges, reviews, and the amazing writing life, including the common inevitable problems we scribbling types encounter daily. SoWrite offers a wonderful environment for writers. Endless encouragement from Jim, a plethora of resources and information, --virtually anything concerning the writing life — makes SoWrite pretty much perfect and a must-visit destination —a writing sanctuary. A lifestyle. You get the idea. Check it out, see for yourself. Here at Incoming Bytes, for Great Websites, we think kudos and congratulations should be going out to Jim Bessey at SoWrite. Great stuff, bud! Best wishes for 2016 and beyond!